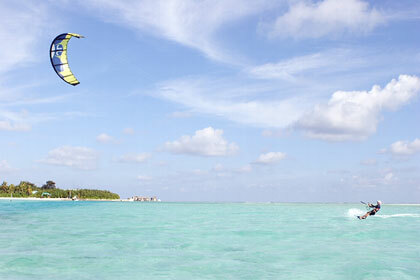 The Maldives is the ideal location for water sports enthusiasts. 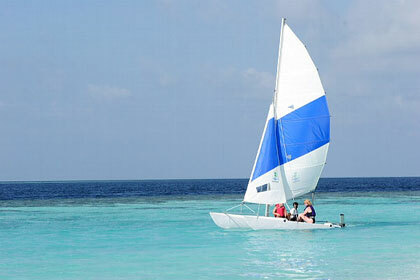 Whether you are a novice or a professional Maldives waters will thrill you. Resorts and cruise vessels that cater tourist market offers variety of water sports activities. You can higher the equipment and facilities for a reasonable price in most of the resorts. Whether you are a beginner or an enthusiast Maldives climate and wind condition will give you the room for getting most out of windsurfing. Resort islands have large lagoons where beginners can practice before they can hit the blue waters. If you are an enthusiast you can hit the wave and the set your sail for the wind to get that extra speed. Most of the resorts have windsurfing schools where you could take instructions and lessons. Some do run certificate courses in windsurfing. Surfing schools are well quipped with trainers. So you can surf till you drop. You don’t need to be a deep sea diver to see what lies beneath the tropical waters of Maldives. Sometimes you don’t even need a mask or fins to see the beautiful fish playing in their coral nest. The water is so clear, that it looks as though you are looking through a glass aquarium. If you want get little closer then get a mask and fins. Snorkelling over the shallow crystal clear water of the islands lagoon is an ideal way to explore the underwater world. House reefs of most of the islands are just a few meters away from the beach. Snorkelling equipment is available at all the resorts and cruise boats. Mask and fins can be rented from the diving schools if you need them. Most of the resorts organise regular snorkelling excursions to give visitors a chance to experience the diversity of marine life and reef structures in the Maldives. Choose a mask that fits snugly. Test this by putting it to your face without using the strap and breathe in through the nose. If it fits properly it will not fall off, even when you lean forward. Choose a pair of fins that fit your feet comfortably and a snorkel that fits easily in to your mouth. Get advice on the best snorkelling spots and how to reach them. Find out the potential problems such as waves, currents and difficult entries and exits. Wear a t-shirt to protect yourself from the sun and a waterproof sunscreen on exposed areas of your skin such as the neck and the back of your knees. And finally, do not walk or step on the corals, to protect yourself and the corals from injury and damage. Many resorts have their own speed boats and skis which you can rent on per hour basis. Some of the resorts have in house instructors who can provide lessons if you require. Maldives waters are safe and the resort provides life guards. Resorts at the high end of the market offers Para-sailing. Equipment and service (boat and sail, and guide) for this adventurous pastime can be hired from the resort. Para-sailing is a fantastic sport for those adventurous enough to go through the challenge. Through Para-sailing you can experience the breathtaking aerial view of lush green vegetation and clear blue waters. If you fancy sailing towards the seen of the sunset then this is the sport that you will love. Catamaran sailing is a very tranquil and refreshing sports enjoyed by many visitors. Watching dolphins and sailing with birds is possibility that you will never want to miss. Get ready to embark on a new adventure of Catamaran sailing on the beautiful blue waters of the Maldives.